The Social Concerns Committee's purpose is to research, educate, and advocate on issues of social concern in the community, state, nation, and world. Social Concerns meets on the 4th Tuesday of each month at 7:00 PM. For any questions about the committee or the content of this page, please send us an email. The Social Concerns Committee, along with Church Council, were responsible for installing a new banner this fall. The banner provides a welcoming message to ALL in our community of Midland and beyond. Coffee Chat Collective is providing a new opportunity to socialize and make new friends! Sunday Night Suppers will be held on the first Sunday of each month beginning Sunday, December 3rd. For full details, and to sign up for a dinner, please visit the site below. Location details to be determined. Thanks to the members of the Collective for developing this new initiative! On the second Saturday of each month we sort donations of clothing and household items at the Shelterhouse Resale Store in the Kmart Plaza from 2-6 P.M. The proceeds of this store directly fund services of the local Shelterhouse, which provides shelter, legal advocacy, and counseling for victims of sexual assault or domestic violence. We invite adults and youth 10 years and older to volunteer for this effort. 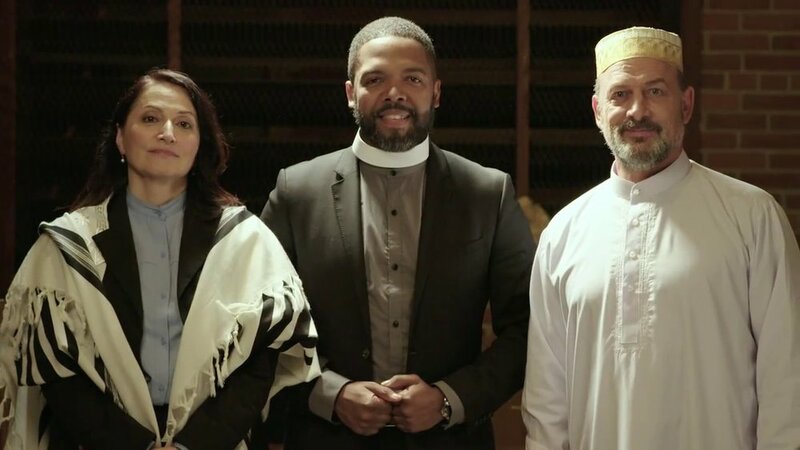 Photo from UCC, Trading Places video on interfaith unity. Through our Interfaith Initiatives we reach out to our community — building friendships through Interfaith Friends potlucks and projects; collecting needed items for anticipated Syrian refugees; sponsoring educational opportunities in coordination with the Islamic Center of Midland; and actively looking for opportunities to interact with and advocate for people of different faiths. UCC Midland is part of the Interfaith Friends group which has been meeting for a little over a year. This organization includes members from various faith communities around Midland, including members from the Islamic Center, the Jewish faith, the Bahai tradition, Blessed Sacrament Church, The Church of Jesus Christ of Latter Day Saints, and Holy Family Episcopal Church, among others. The major project of this group to date is establishing the Foster Care Closet where children going into foster care can get essential clothing, bedding, and other items when they are removed from their homes. The United Church of Christ national website launched an initiative called, Building Bridges: Linking Our Muslim and Christian Communities, to connect people with resources to learn about Islam; inform people on becoming advocates for Muslims in their communities; provide tools to assist people in engaging with their Muslim neighbors; and suggestions on ways to display your solidarity for our Muslim communities. The Council on American-Islamic Relations (CAIR), the nation's largest Muslim civil rights organization, is an advocacy organization that seeks protections for American Muslims though challenging anti-Muslim discrimination across the country. CAIR is based in Washington D.C. and provides an, "Islamic perspective on issues of importance to the American public." The focus of CAIR is to ensure that the rights guaranteed to all Americans are enforced. You can learn more about CAIR at cair.com. CAIR also provides a resource on ways to show your support and be an ally to Muslims. Learn before you Leap. It is impossible to act in solidarity with those we are not willing to hear. Do not assume you understand another's pain. The manifestations of oppression differ and each must be acknowledged in its own right. Do your own work for your own sake. Understand the cost of white privilege, the toll of racism, and why dismantling racism is necessary for your own liberation. Be a servant, not a Savior. Liberation must be led by those being oppressed. Their pain and their power must be at the center of the work. In anti-racism work, "ally" is a verb, not a noun. It is only relevant when describing one's current act(s) of solidarity. Those you stand with determine whether or not you are an ally. Commit to doing white people's work, establishing solidarity with other white folk who are committed. Establish 'whiteness accountability cohorts'. Continue to show up. Even when your presence is misunderstood. Define your lane and commit to riding in it. Don't over promise and try not to under-deliver. Use your privilege to make space for others to tell their own story: not you telling it. Do not appropriate the pain of others. Defer to those being targeted. Give yourself space for Grace.